This is part 2 of a 2 part series on ROARlocal’s “How to” mini course on creating a killer landing page. Part 1 covered the elements of a landing page, while part 2 will go through the design and copywriting essentials of a landing page. Keep things clean, simple and minimize distractions. Remove menus, links, multiple call to actions, etc. Focus on getting visitors to take the action you want them to take. 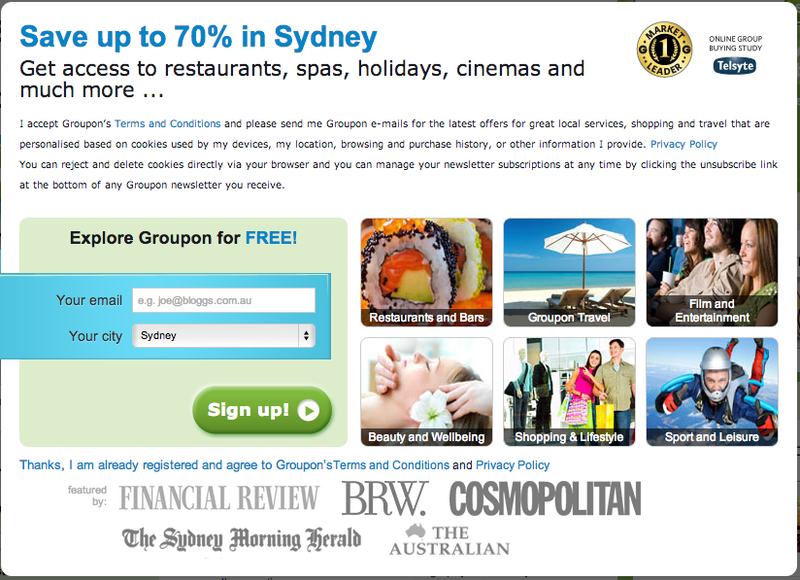 The following example from Groupon has been overused, but it has been so precisely because it works. Attractive and classy, yet simple and obvious what you, the user, has to do. Use ample amount of white space so as not to intimidate the visitor. 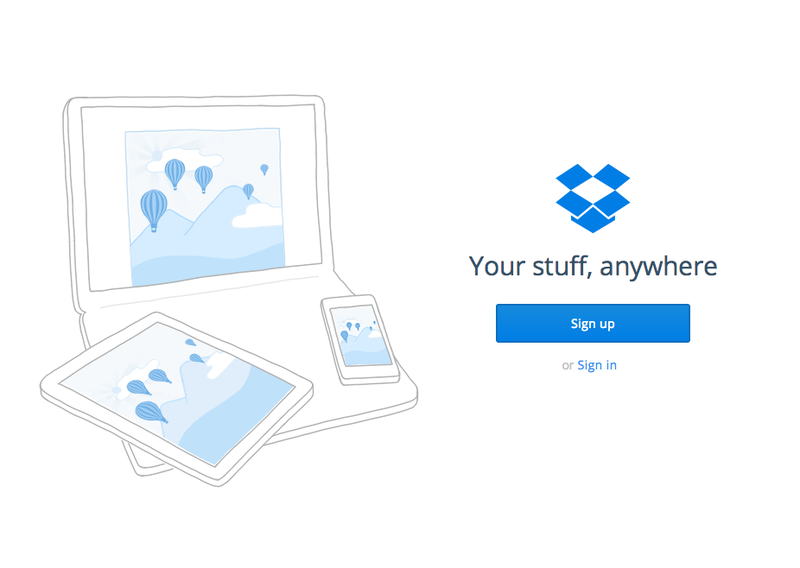 This is how dropbox do it. I mentioned this earlier in part 1 (your premise/unifying theme) but I’ll mention it again – the design must match the desires and expectations of your prospects. Every element on the page should encourage the user to take your desired action. Design your landing opage is it is all in alignment, this design will give you a logical visual hierarchy for your site. Determine the order in which you want your visitor to look, and design your landing page to support that order. Graphics and contrast can be creatively manipulated here to direct the visitor’s eyes and create more attention at specific spots. The consequential benefit is that visitors can absorb the information at a faster rate and be more inclined to perform your desired action. Place your most important information above the fold, which is the space visitors see without having to scroll down. It is essential to have your call to action button there as well. Note: It may not always be true though! Sometimes a call to action right at the end of the page converts better, it depends on situation and so it is imperative to test. For a landing page to be great, visitors must be able to understand what the page is about, the value of your offer, and what they need to do in less than 3-5 seconds. Always be testing, run A/B tests, change copy, images and call to actions to see what resonates most with visitors. Because even simple changes in the positioning of the call to action button can have a significant impact on conversion rates. This is crucial in getting your visitor to perform your desired action. Use verbs to give stronger, more definitive instructions instead of weak adjectives. This makes it easier for the reader to understand. In other words, portray the value – benefits – a user will get as clearly as possible. Make it loud. This is a narrative mode in which the main character is referred to by employment of second person personal pronouns – “you”. This is the most important word of the copy. The first reason is that it satisfies “what’s in it for me” question that EVERY one of your visitors is asking. 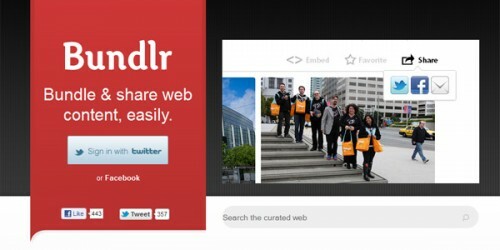 The second reason is that it actually helps visitors visualize how they can use what you are offering to benefit them. These words appeal to the readers’ sense, emotions, and feelings. They pique interest and deepen the connection. Or to put it simply, these are the words which your prospective customers use daily. Use these words to talk to them like a friend and let them know you understand them. For instance, “Get new tips”, “discover new tips”, “uncover new tips”, “acquire new tips”, “learn new tips” all have different connotations. It is up to you to find the one that allows you to communicate best with your visitor. Once you are able to do that, you will be able to trigger certain emotional responses in them that motivates them to perform your desired action. The alignment of research, design and copywriting is what a great landing page is built on. A good landing page is the combination of relevant direct response style design and persuasive copywriting. And it is based on the understanding of user trends, psychology and marketing. See your landing page as a story, a plot that starts off with a problem, continues with rising action, hits a climax, and ends with a resolution. Use your landing page information hierarchy to get your user to come to a series of “micro-yeses”, which will then culminate into a macro-yes – your most desired action. C represents conversion, and it depends on how you use your design and copywriting to reflect your value proposition in line with the visitor’s motivation, and provide relevant incentives while reducing friction and anxiety. The AIDA effect (attention, interest, desire, action) it achieves will produce an exponential hike in conversions and sales. If you want to turn your landing page into a sales generating machine. Want us to turn your website into a selling machine? Then get in touch with us here for an informal chat so we can learn more about you, your business and your goals.